Info: This feature requires Elvis DAM version 5.3.1 or higher. The Pro Client is one of the ways of accessing Elvis 5 through a Web browser. 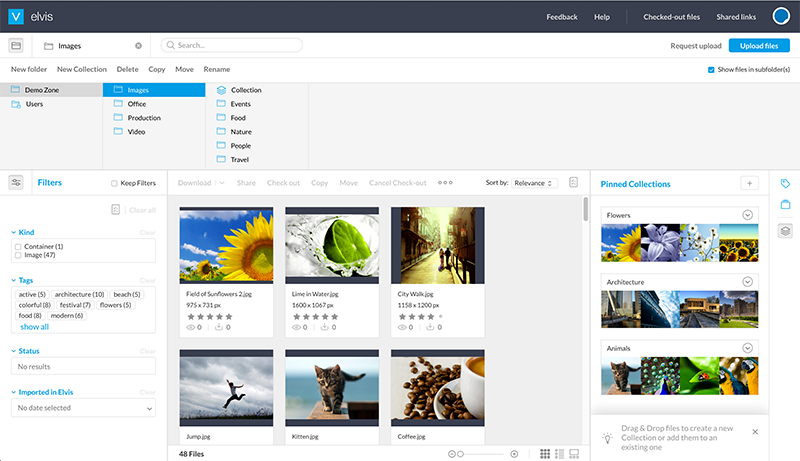 It provides easy access to content that is stored in Elvis and because of its wide range of features it is perfect for both general and advanced use. Figure: Accessing content in Elvis through the Pro Client. Your system administrator will have set up the Pro client for you, ready for use. No installation or configuration steps are needed on your side. Depending on your role, you will have been given full or limited access to the available features in the Pro client and the assets stored in Elvis. You may therefore not see all of the features described here in this article or be able to use them. When in doubt, contact your system administrator. The look and feel of the Pro client can be changed to match the style of the brand that the Pro client is used for, for example by matching it with the branding of a company, product or publication. The Pro client may therefore look different than shown here but the described features are the same. You access the Pro client through a Web link by using a supported Web browser. Enter the link that is provided by your system administrator and log in using your credentials. The default functionality of the Pro client can be extended by using plug-ins. Each plug-in will add its own functionality and it depends on the type of plug-in and how it is set up how it can be used in the Pro client. Some plug-ins will add automated functionality such as archiving files when they reach a particular status while other add functionality that can be manually triggered by clicking a button or a context menu command, or by using a panel. Figure: In this example, geo-tagged assets can be viewed via Google Maps. 2 October 2018: Added section 'Using features added by plug-ins'.